Cookston loves how well romaine chars. She recommends removing the outermost leaves, brushing with her baste and grilling whole for 30 seconds to 1 minute per side, or just long enough to generate grill marks. This short cook time means the core will still be a bit cool, but the outer leaves will keep their texture. After grilling, Cookston trims off the root end and serves either as-is, or with Caesar dressing drizzled over the top. Cookston says that grilling kale not only gives it a nice smoky flavor, it also removes some of its natural bitterness. She brushes both sides of the leaves and grills them whole, about 1 ½ to 2 minutes per side on a medium-hot grill. Grilling makes the kale leaves crispy, almost like chips. 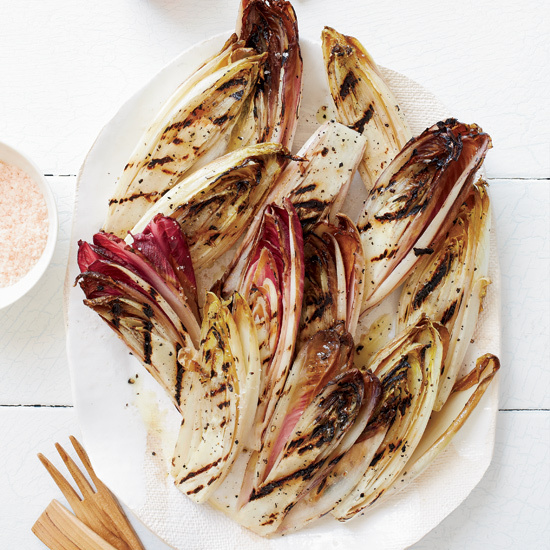 This perennial Italian chicory is the firmest choice for grilling. Plus, Cookston says, the char and heat tone down its intense bitter taste. She prepares a head by cutting it in half, brushing the cut sides with the baste and grilling at medium-high to high for 4 to 5 minutes. A cousin to radicchio, Belgian endive has “a bit more delicate and less bitter flavor.” To prepare, simply trim the root end, cut in half, then brush and grill cut sides on a medium-hot grill for 2 to 3 minutes. Cookston prefers cooking tender baby bok choy on a grill with two heat zones. After cutting in half and brushing all sides, she places the head on the hottest portion of the grill for 2 minutes per side to get some grill marks, then moves it to the cooler portion of the grill for 3 to 4 more minutes per each side, or until tender. “I have become enamored with grilling butter lettuce lately,” says Cookston. Although they seem delicate, Cookston says butter leaves are heartier on the grill than the other lettuces. She suggests splitting the lettuce in half, lightly brushing it with the baste and then grilling it cut side down for 2 to 3 minutes over medium heat, or until it is slightly charred and wilted. The texture of this lettuce lends itself to serving with a creamy dressing. If you don’t have time to make one, try a store-bought ranch to which you’ve added some chopped fresh tarragon. * If you are cooking at very high heat or for more than a couple of minutes, try a high-temperature oil like peanut. **For a change of flavor, replace the lemon juice with your favorite vinegar.